I am trying to pare down the amount of frozen food I have in the Utah freezer. I am always afraid that power will go out or the old refrigerator will break and we will come back to a mess of decomposing food. I suppose that visual is not too appetizing for a food blog. 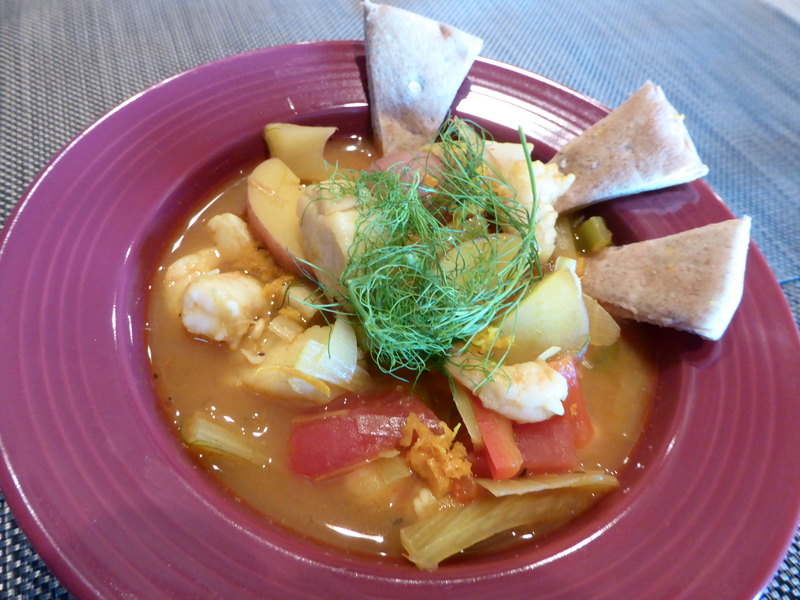 A good, healthy dish is this fish soup inspired by Rick Stein’s dish of the same name. I am able to use shrimp, scallops, and cod from packages that had been opened previously. We saute carrots, leeks, fennel, and onions. Then we add some quick fish stock made with the shrimp shells and a bottle of clam juice as well as white wine, water, and a touch of Pernod. The potatoes and tomatoes cook next and at the end we add the fish and shell fish. A garnish of fennel fronds, pita points, and a drizzle of olive oil finish the dish.